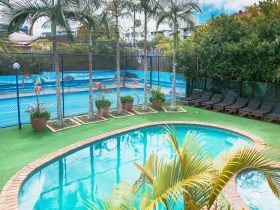 The Park Hotel Brisbane offers boutique accommodation in Spring Hill, just 10 minutes’ walk to the Central Business District and within close proximity of lively restaurants, shopping and entertainment. The hotel features a chic, sophisticated lobby; modern accommodation; premium bathrooms including rain showers; a stylishly appointed executive suite. 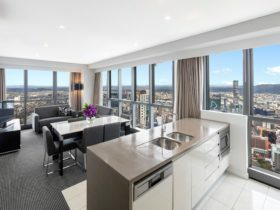 Retreat and relax with panoramic views of Roma Street Parkland and Brisbane City. The hotel also features a number of contemporary conference facilities. 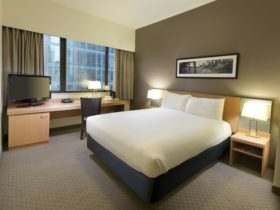 The Park Hotel Brisbane is the perfect hotel choice for business travelers or couples seeking a weekend away. 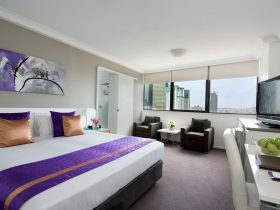 Superior rooms feature one queen bed with plush comfort plush bedding and private balcony. Furnishing and amenities include; free unlimited high-speed WiFi, table with casual seating, work station, LCD television with internet, selected Foxtel channels and movies on demand (charges apply), mini bar, complimentary tea and coffee making facilities, coffee pod machine with two complimentary pods per day, iron and board, reverse cycle air-conditioning and private bathroom with walk-in shower with rain-shower. The Deluxe King Rooms feature one King bed with plush comfort plus bedding. Furnishing and amenities include; free unlimited high-speed WiFi, chaise lounge, table with casual seating, business desk, LCD television with internet, selected Foxtel channels and movies on demand (charges apply), mini bar, complimentary tea and coffee making facilities, coffee pod machine with two complimentary pods per day, iron and board, reverse cycle air-conditioning and private bathroom with walk-in shower (rain-shower and handheld). Deluxe Twin Rooms feature two double or two queen size beds with plush comfort plus bedding, some with balcony. Furnishing and amenities include; free unlimited high-speed WiFi, table with casual seating, business desk, LCD television with internet, selected Foxtel channels and movies on demand (charges apply), mini bar, complimentary tea and coffee making facilities, coffee pod machine with two complimentary pods per day, iron and board, reverse cycle air-conditioning and private bathroom with walk-in shower (rain-shower and handheld). Inspired by the sunshine state, the Park Suite melds a fresh, vibrant colour scheme with luxurious, quality furnishings and walk-in robe. 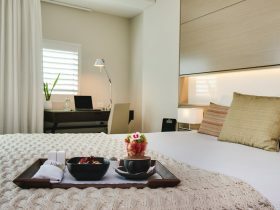 The Park Suite features luxurious comfort plus king size bedding and spectacular views of Brisbane city and the Roma Street Parklands. It also has its own lounge room with plush ottoman lounge and desk. Furnishing and amenities include; free unlimited high-speed WiFi, two LCD television with internet, selected Foxtel channels and movies on demand (charges apply), mini bar, complimentary tea and coffee making facilities, coffee pod machine with two complimentary pods per day, iron and board, reverse cycle air-conditioning and private bathroom with walk-in shower (rain-shower and handheld). From price is based on Superior Queen Room. Please visit the website for accurate pricing for your stay.